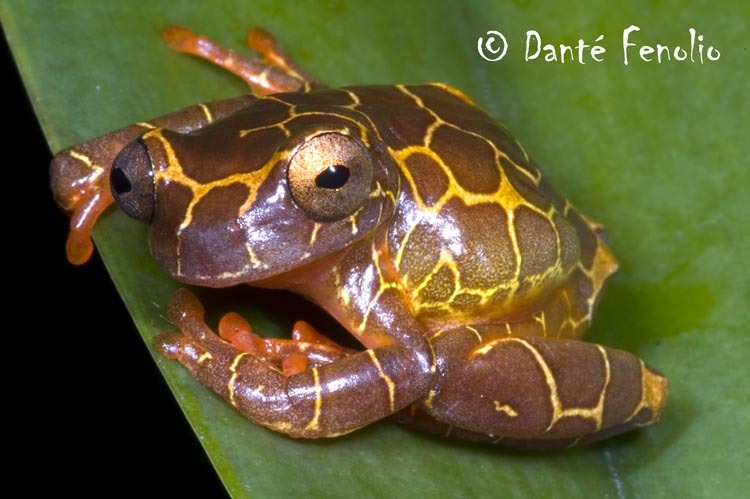 The Clown Treefrog, Dendropsophus leucophyllatus, is a common species over most of its range. It is often found in and around human habitation. In the Amazonian city of Iquitos it has even been observed in cesspools that have floating vegetation. This little frog is quite adaptable, at home in tropical and subtropical rainforest, marshes, and flooded grassland. They are often found in prairie-like habitat which is sparse in trees, but has grasses and bromeliads. In Bolivia they have been found in urban areas and gardens. Clown treefrogs are also found in forest clearings that have pools. Mating takes place in these pools and in oxbows that are overrun with floating vegetation. Similar to the mating habits of the Red-Eyed Tree Frog, Agalychnis callidryas, eggs of Dendropsophus leucophyllatus are laid on leaves that over hang the water. Upon hatching the tadpoles drop into the water below, where they continue their development. There are two distinct color morphs of the Clown Treefrog: the more commonly seen "hourglass" morph and the "giraffe" morph. The "hourglass" morph is the one most seen in the pet trade and can often be confused with other small treefrogs of the Dendropsophus genus. Fortunately, or unfortunately, depending on your viewpoint, most other frogs of this genus rarely make it into the trade. However, there is another small treefrog species that is unrelated and is often confused with D. leucophyllatus. That species is Afrixalus fornasini of the African treefrog family, Hyperoliidae. That species is quite often found in the pet trade. It is very similar in appearance to the Clown Treefrog, but is more striped, with the striping being more toward white than yellow in color. There are also small white dots within the brown parts of A. fornasini's markings. To the confusion and bewilderment of your average frog enthusiast, A. fornasini is often sold under the name of clown treefrog. Now to address the less seen "giraffe" morph. At one time this morph was considered to be a completely different species. It was described by Edward Drinker Cope in 1885 as Hyla favosa. In 1989 Titus, Hillis, and Duellman redescribed it as a color morph of Hyla leucophyllata, which in turn was later reclassified by Julian Faivovich as Dendropsophus leucophyllatus. Most specimens in the pet trade are of wild caught origin. However, there are some captive breeding efforts taking place. Of course, captive bred stock is currently hard to come by. 1. Fenolio, Danté. Danté Keeping & Breeding Clown Treefrogs July 2007; Reptiles/Bowtie Publications. 2. Edmonds, Devin Tree Frogs 2007; TFH Publications. If you have more resource links please submit them - please note that we only link family friendly sites.